I would try and fight the ongoing stereotype of every “white girl” being in love with fall but I can’t since for me, that stereotype rings to be true. It’s the season where we obsess over everything pumpkin and indulge in a few Starbucks seasonal beverages. I was wanting to get my pumpkin on ever since our first cooler day hit but I kept forgetting to buy some because I never marked it on my list. So instead everyone teased me day after day with all of their eager pumpkin making madness until I finally caved and ran to the store just for pumpkin alone. I stocked up on several cans of the ever so popular seasonal star and I will most definitely be experimenting with different recipes. One of my goals is to master a gluten free, dairy free, and egg free pumpkin pie. A baked one. I’ve tried a couple raw pumpkin pies in the past and they were good, but they did not carry the “100% amaze balls” factor. 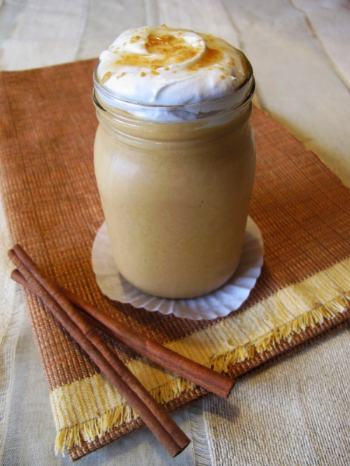 Anyways, stay tuned for that…In the meantime, sip on this creamy, pumpkin smoothie that I’ve created with inspiration from Angela aka Oh She Glows at www.ohsheglows.com. Cheers and “Autumn’s Up!”-from the fall loving, pumpkin errthang white girl. Blend all smoothie ingredients together in a blender until you have reached a creamy, velvety texture. Pour into glass of your choice and garnish however your little heart desires!